For other places with the same name, see Amboli. Amboli is a hill station in south Maharashtra, India. At an altitude of 690 m (2,260 ft) it is the last hill station before the coastal highlands of Goa. The source of the Hiranyakeshi river lies in the hills around Amboli village, and an ancient Shiva temple (called Hiranyakeshwar) sits at the cave where the water emerges. The main attraction for tourists is the incredibly-high rainfall (7 m average, per year) and the numerous waterfalls and mist during the monsoons. Legend has it that there are 108 Shiva temples in and around Amboli, of which only a dozen have been uncovered, one as recently as 2005. 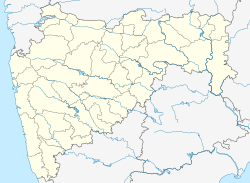 Amboli is well connected by road to the surrounding cities of Kolhapur (128 km (80 mi)), Belgaum 68 km (42 mi), and Panjim (90 km (56 mi)) by road, and the nearest airport is at Belagaum. There are a few hotels at Amboli. Most of them provide hot water baths and have facilities like restaurant, room service and cab services. The only local transport is motorised three-wheeler rickshaws and a couple of private taxis. There are in total 8 places that are listed by Maharashtra Tourism Development Corporation (MTDC). Tourists coming from Mumbai, Goa, Delhi and trains on the Konkan railway can reach Amboli from Sawantwadi Railway Station. There are buses from Karnataka State Road Transport Corporation and Maharashtra State Road Transport Corporation that travel frequently between Belagavi and Sawantwadi via Amboli. Private cars are available from Sawantwadi Railway Station to Amboli. Buses travel to Amboli from Sangli and Kolhapur stations via Nippani-Gadhinglaj-Ajara. Wikimedia Commons has media related to Amboli, Sindhudurg.